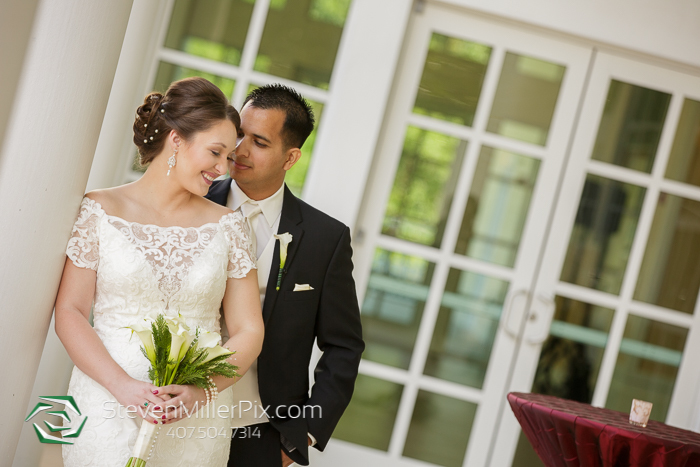 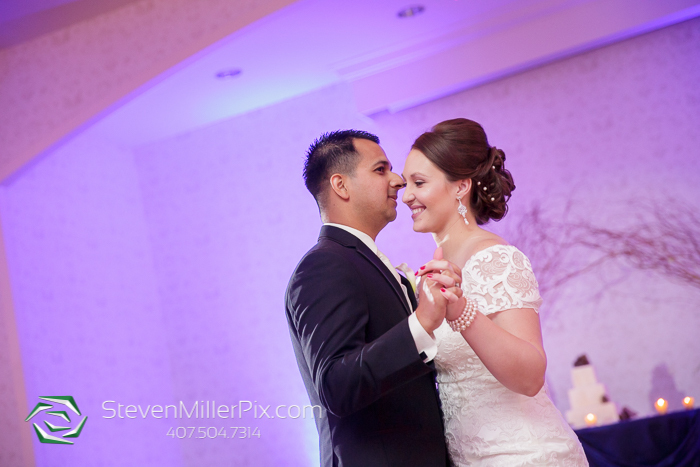 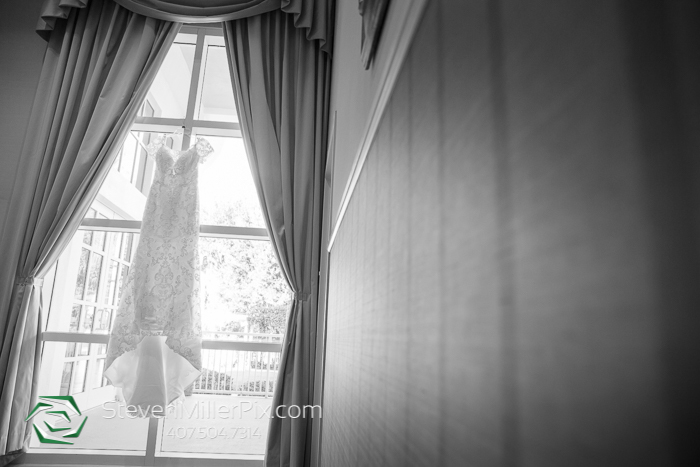 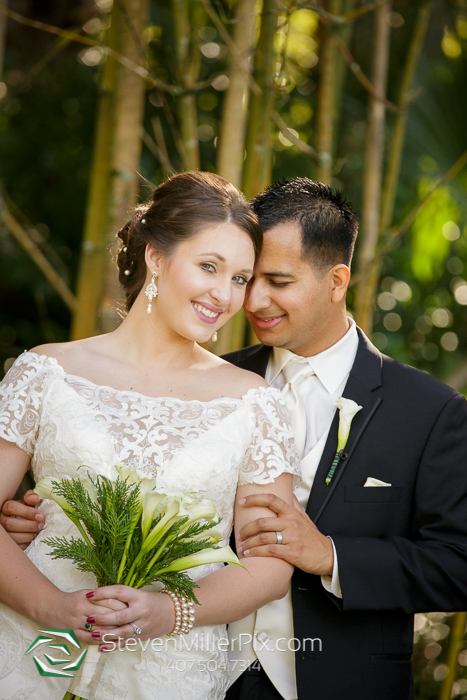 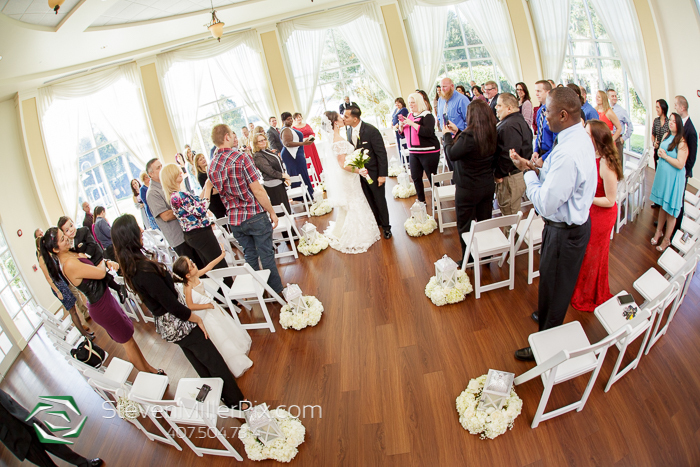 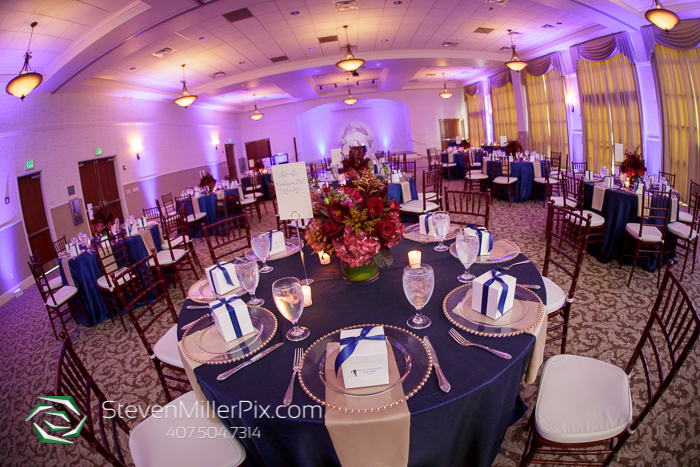 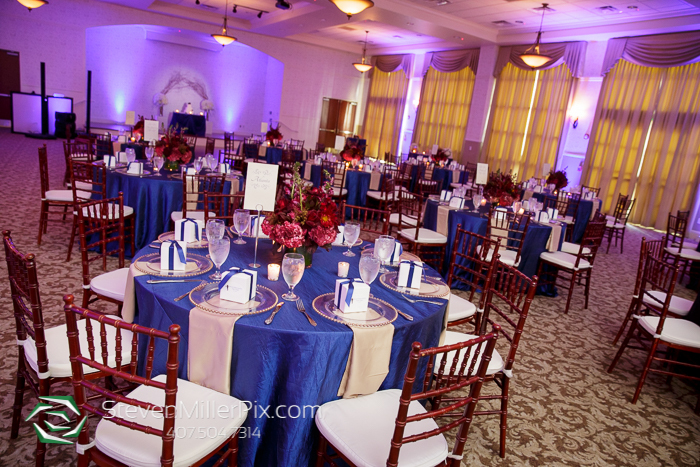 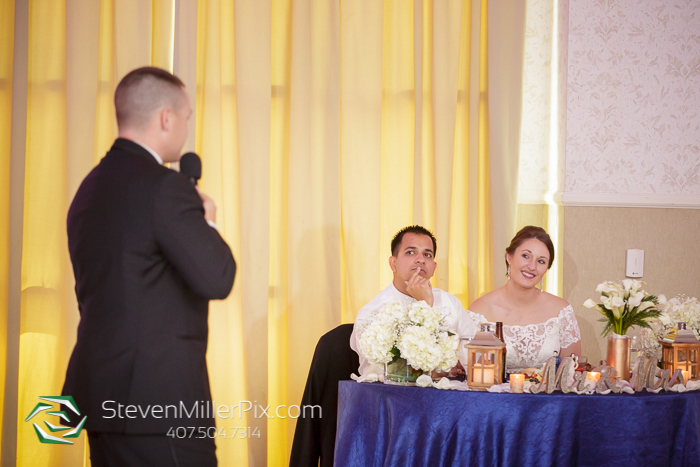 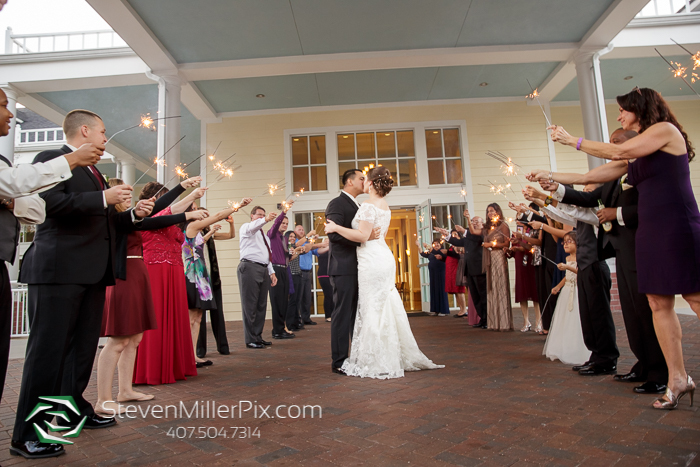 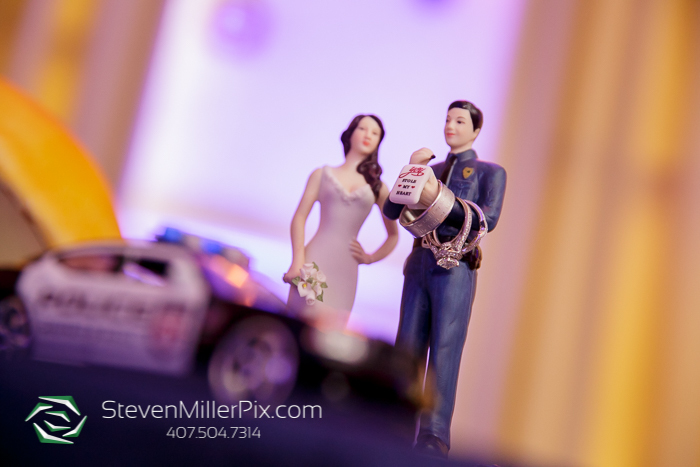 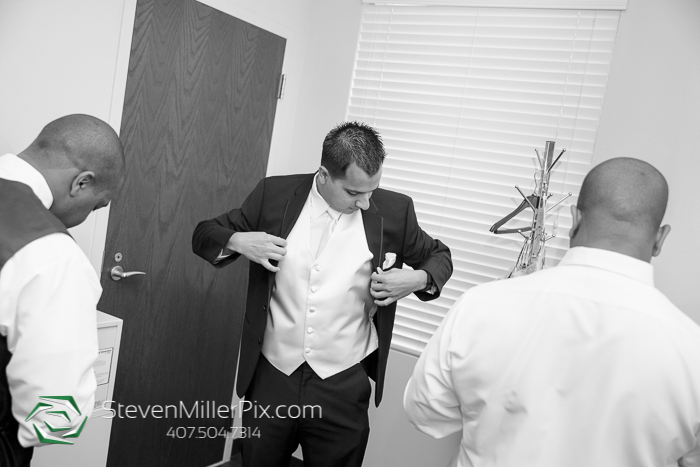 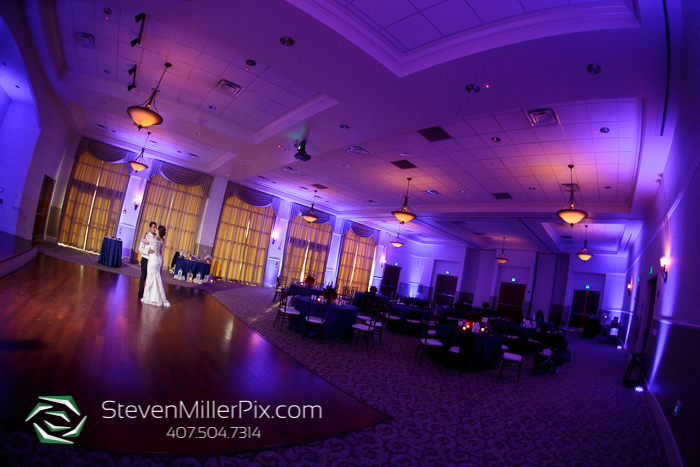 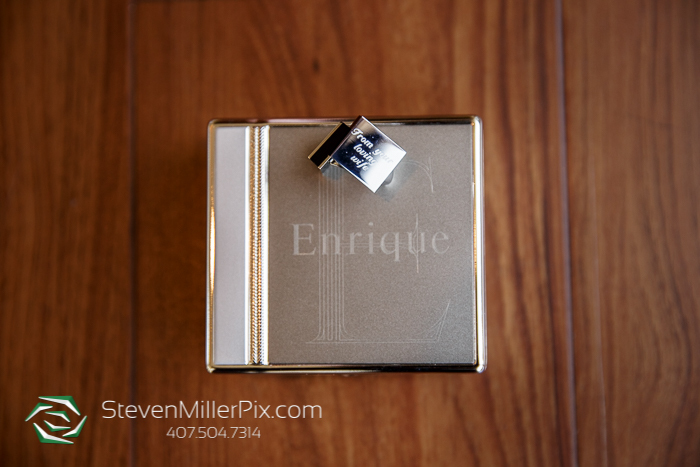 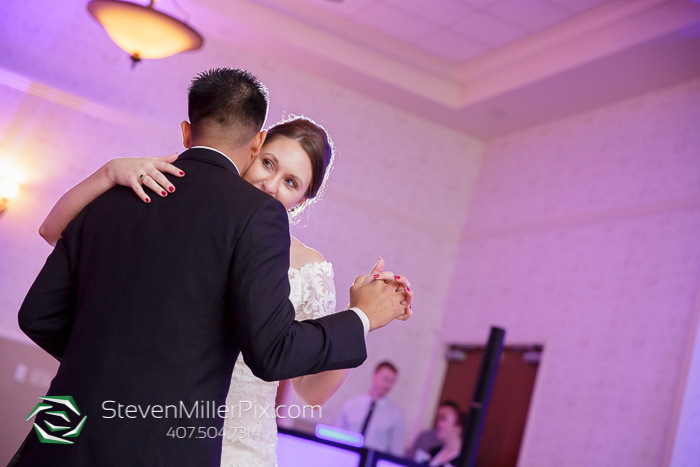 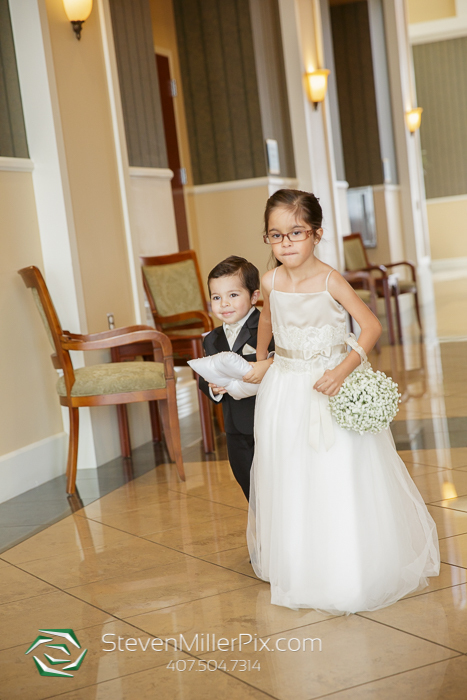 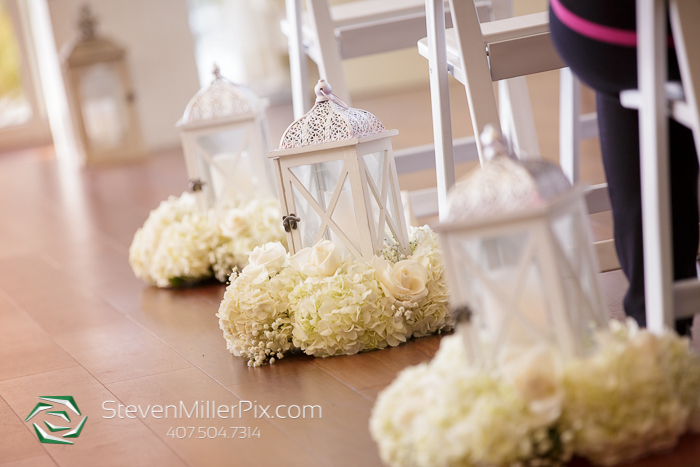 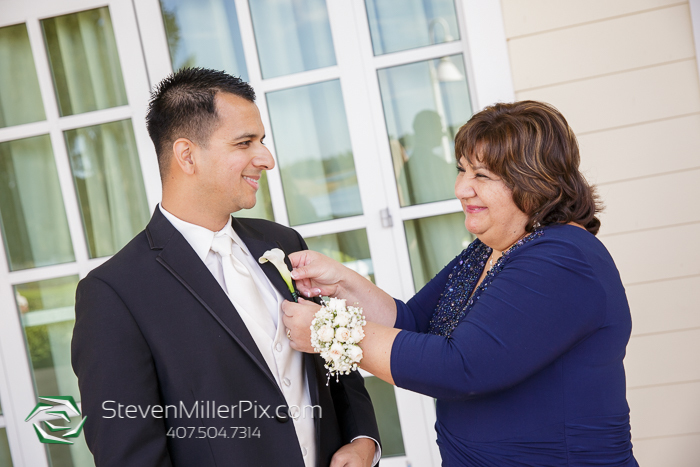 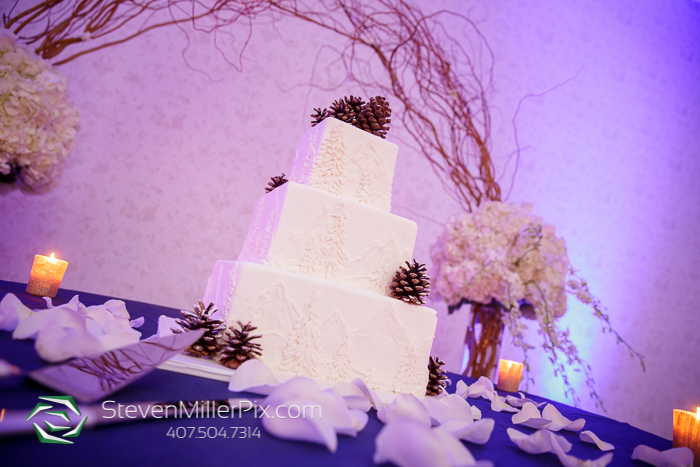 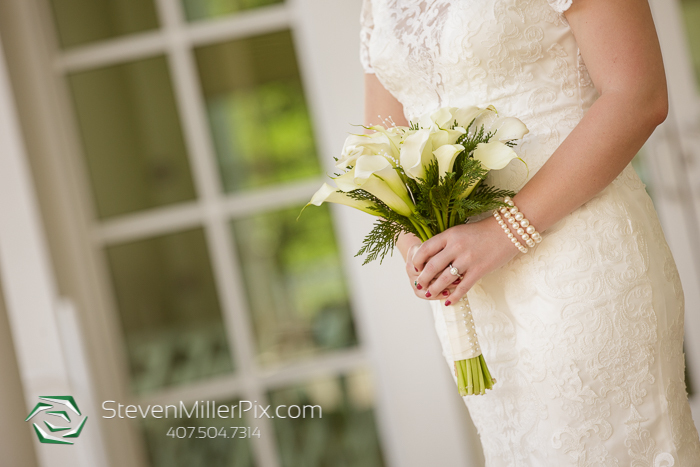 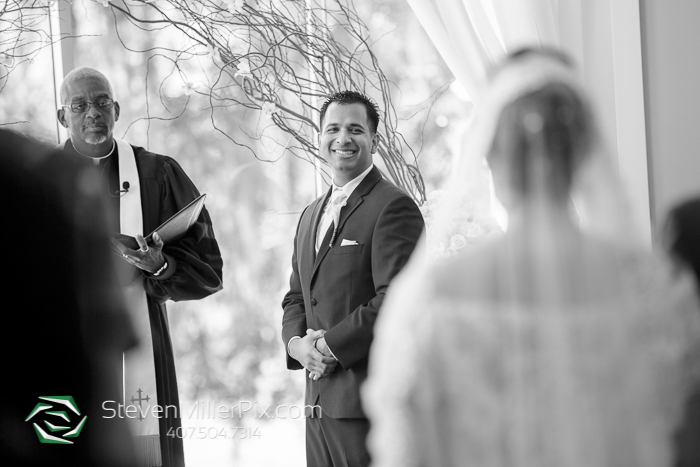 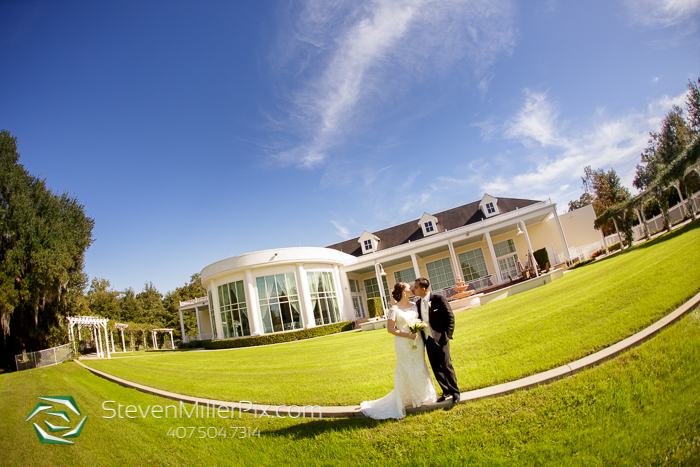 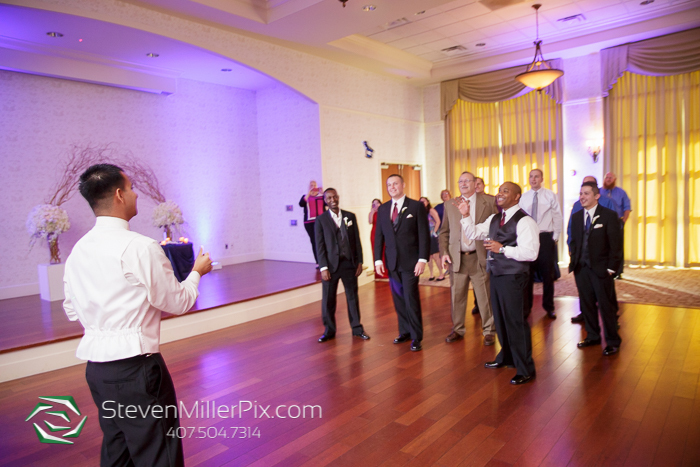 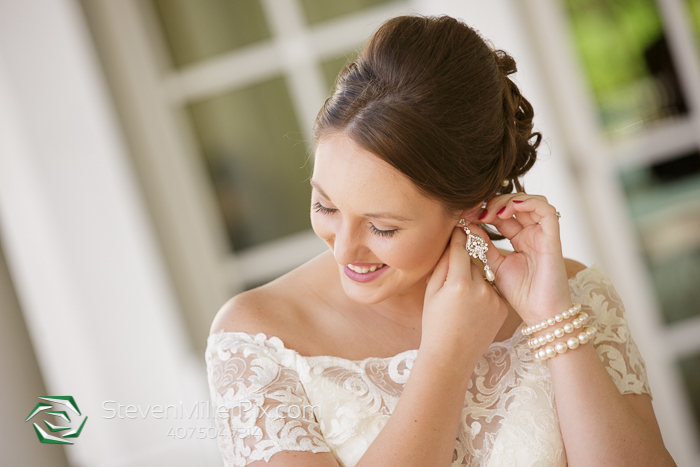 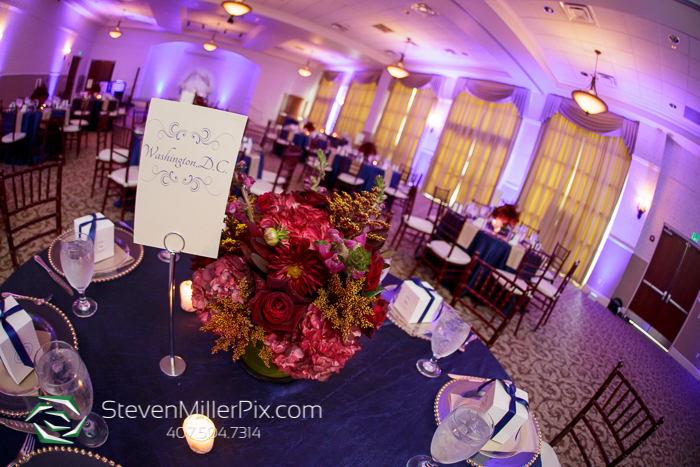 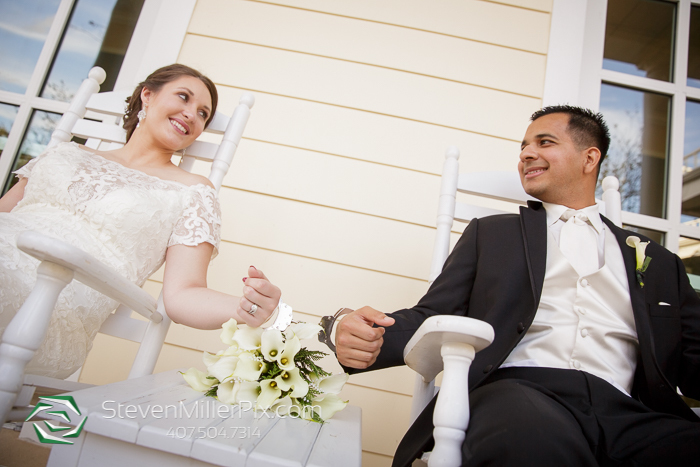 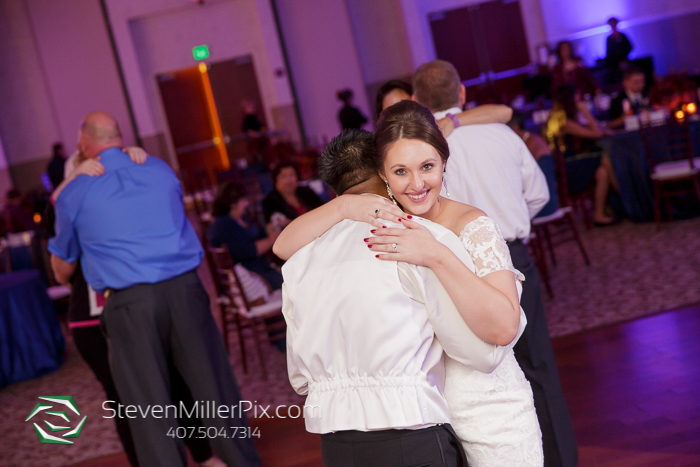 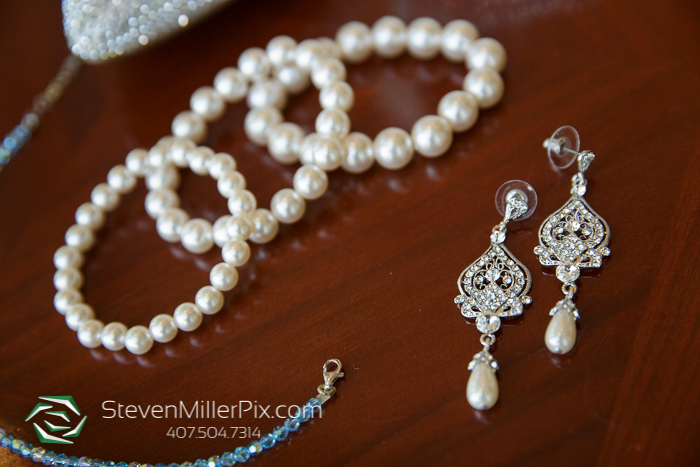 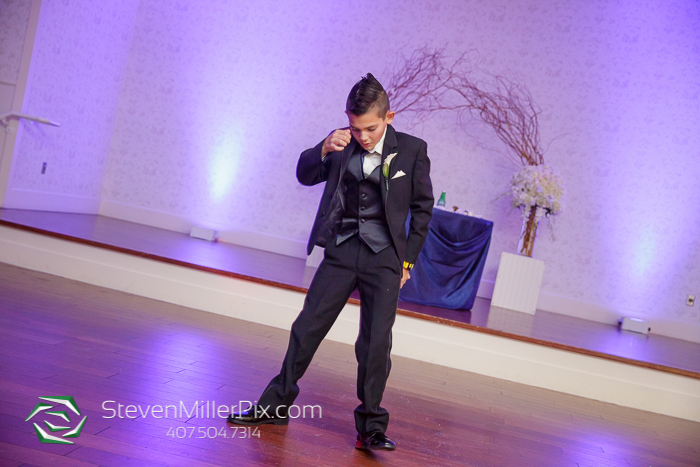 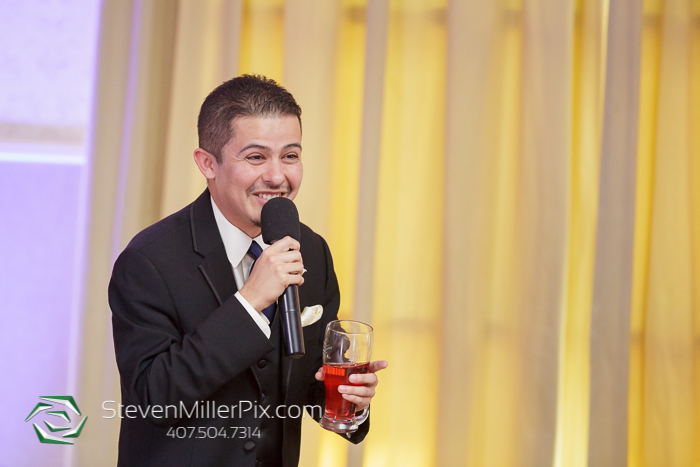 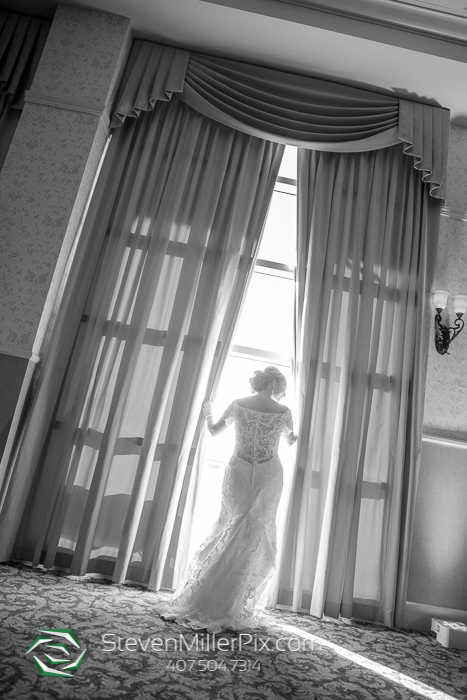 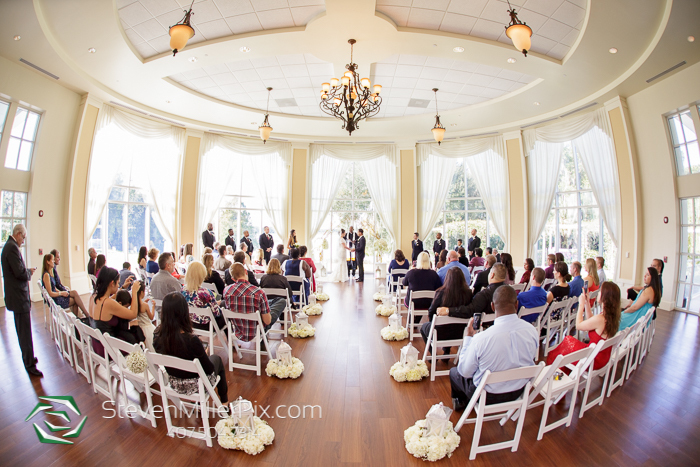 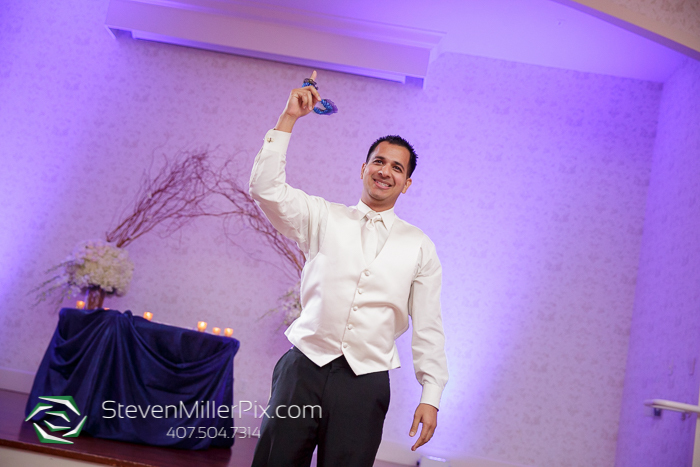 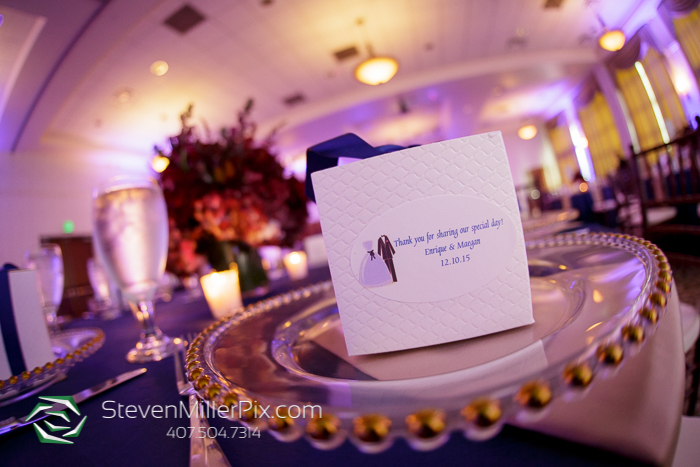 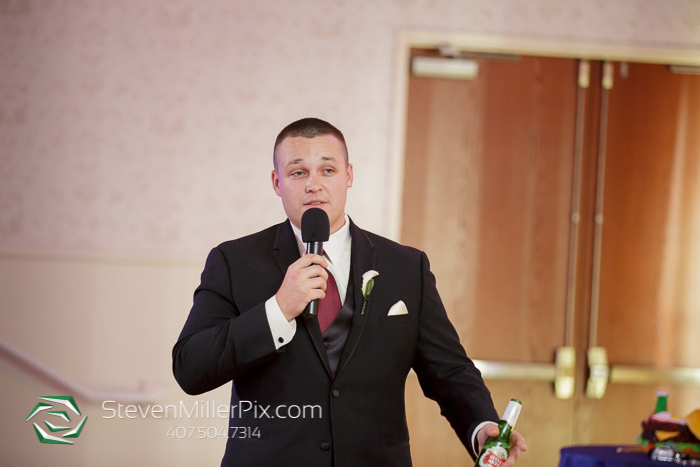 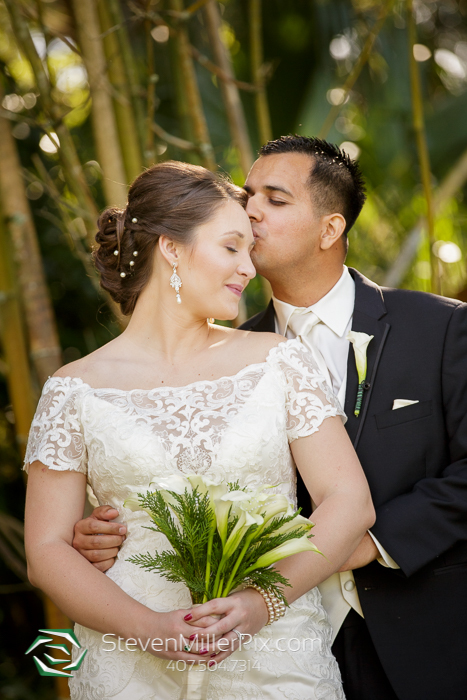 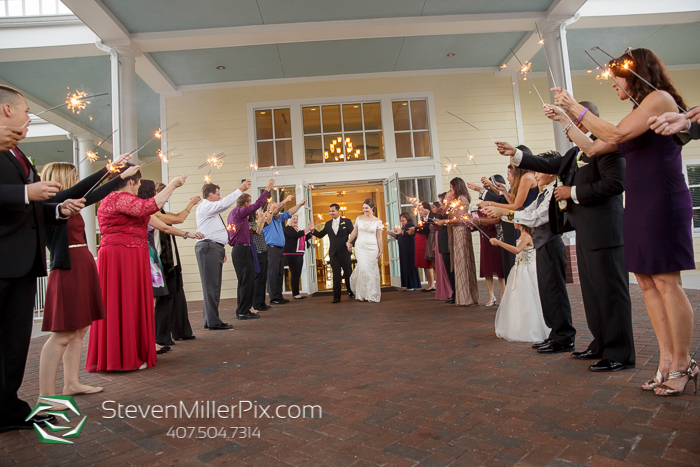 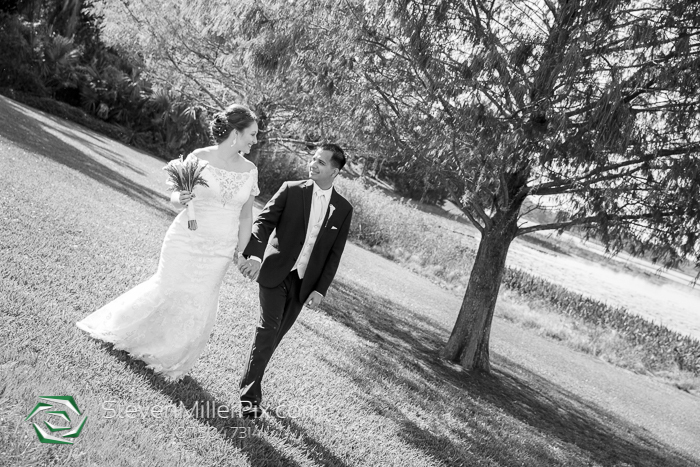 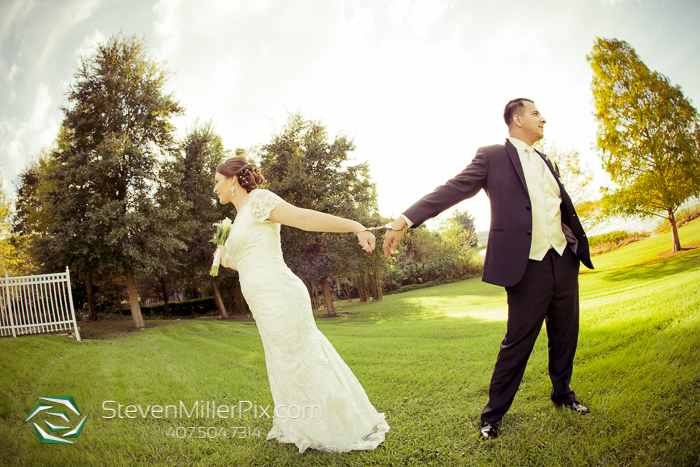 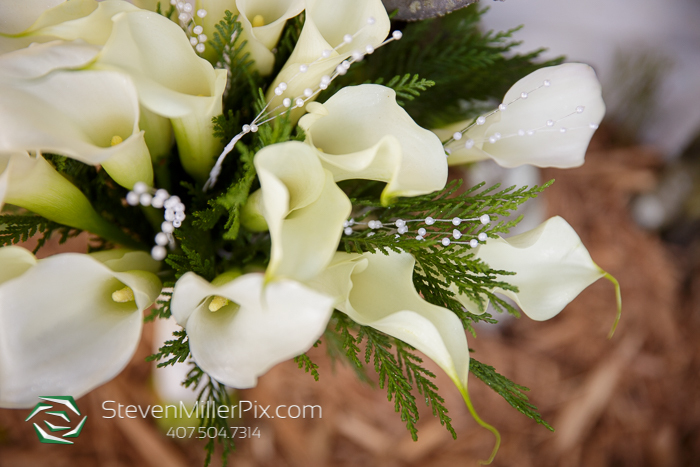 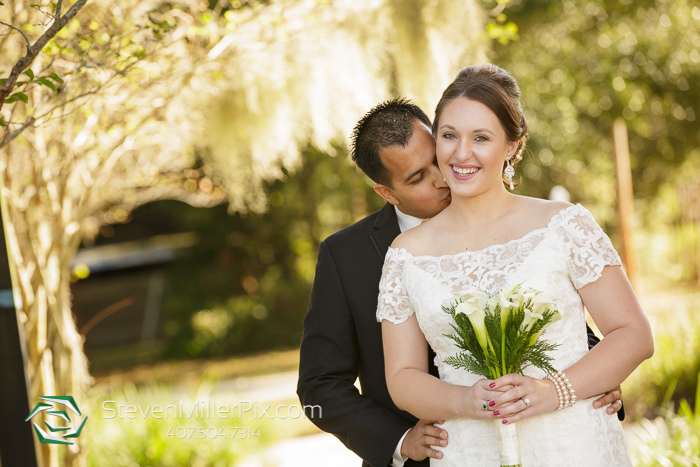 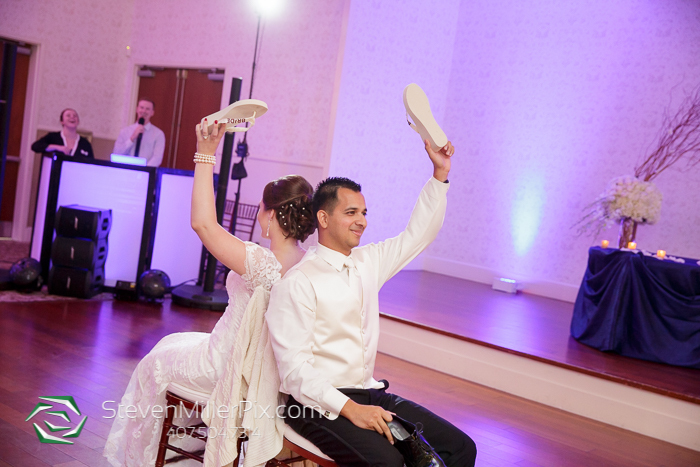 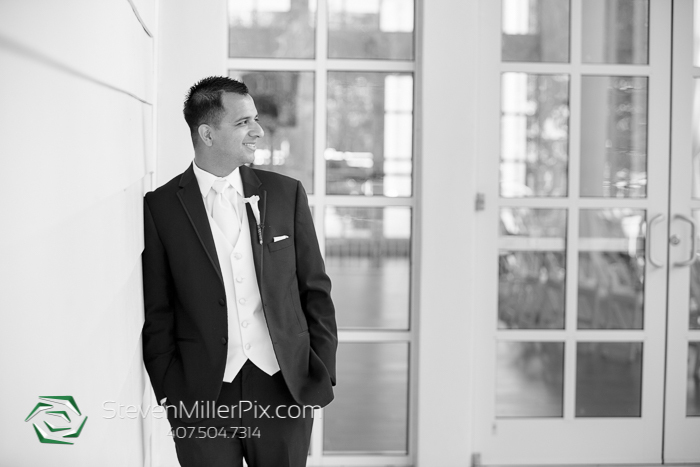 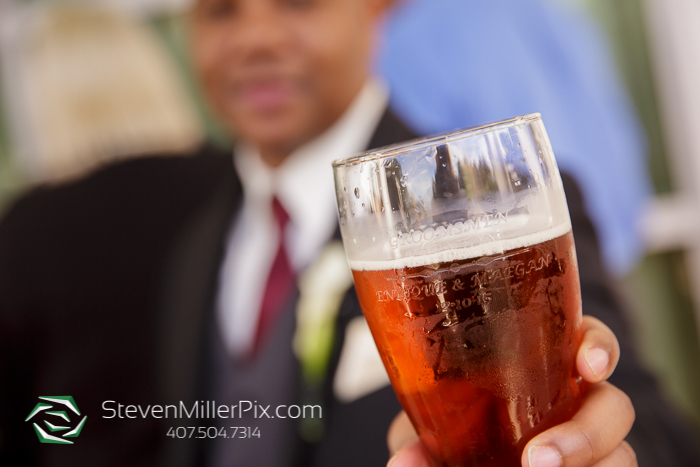 We had such an amazing time capturing the beautiful wedding of Maegan and Enrique at the Lake Mary Events Center! 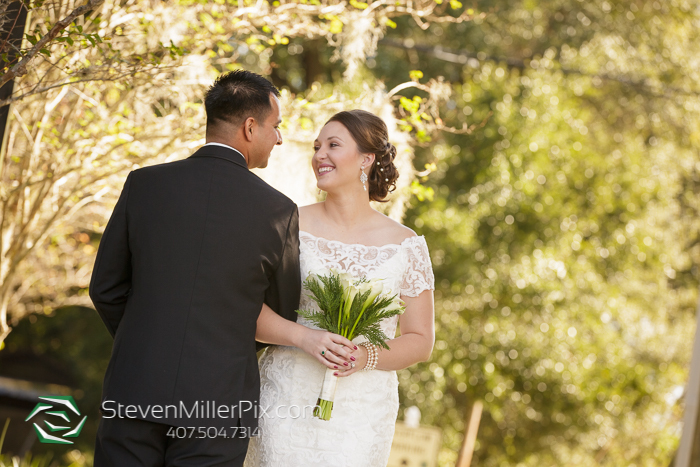 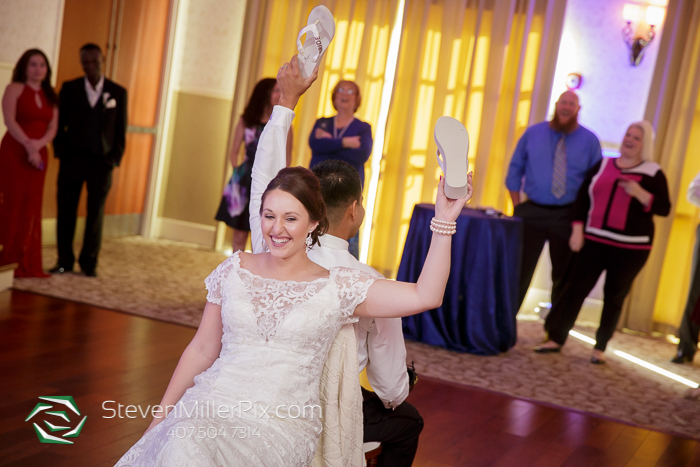 Their wedding day actually began in the morning, a bit different than our typical wedding timeline! 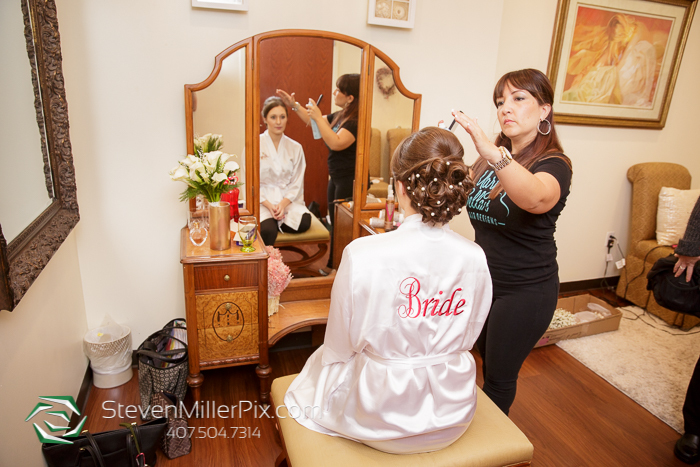 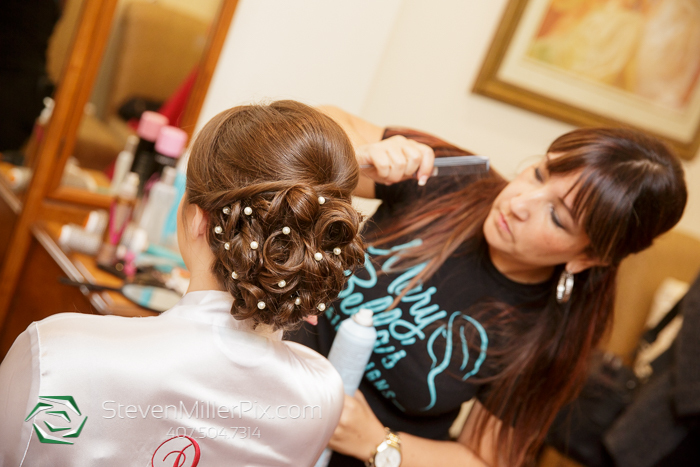 We began the day capturing Maegan’s bridal preparations in her bridal suite, and stopped by the groom’s suite to catch some last minute preparations with Enrique and his guys! 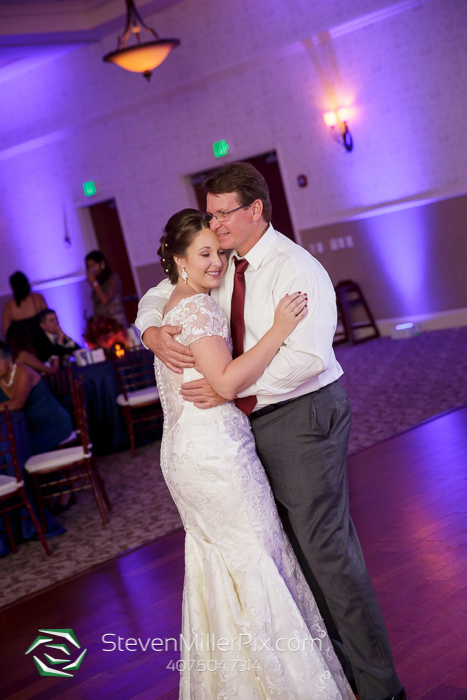 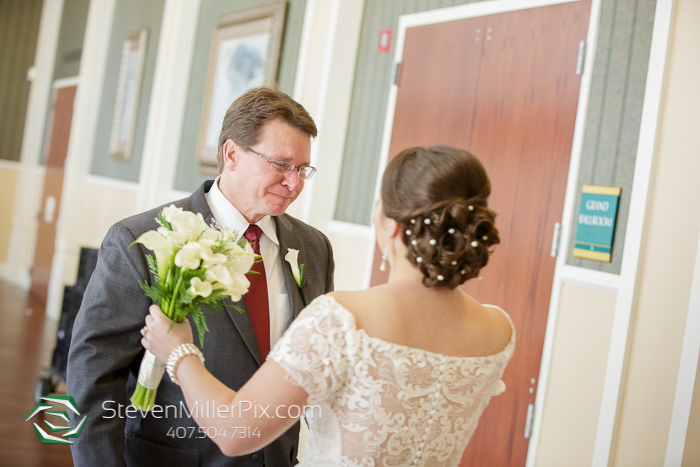 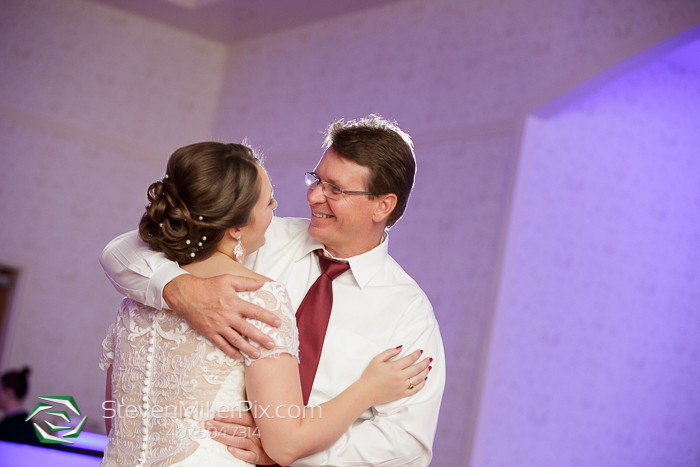 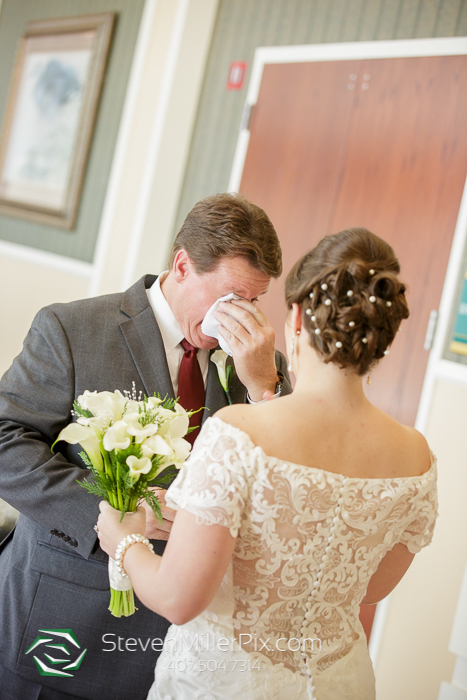 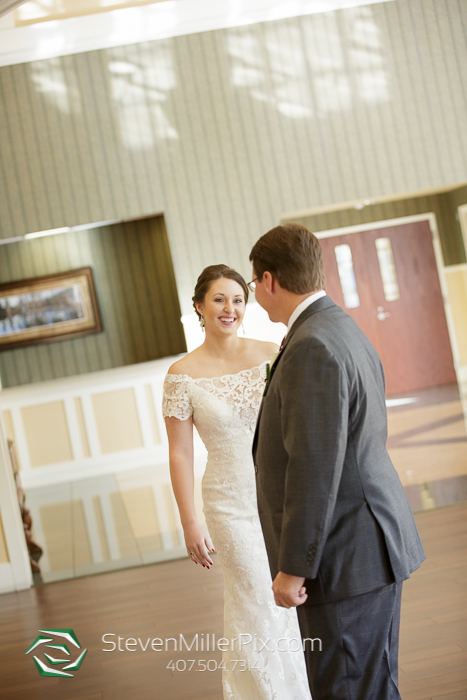 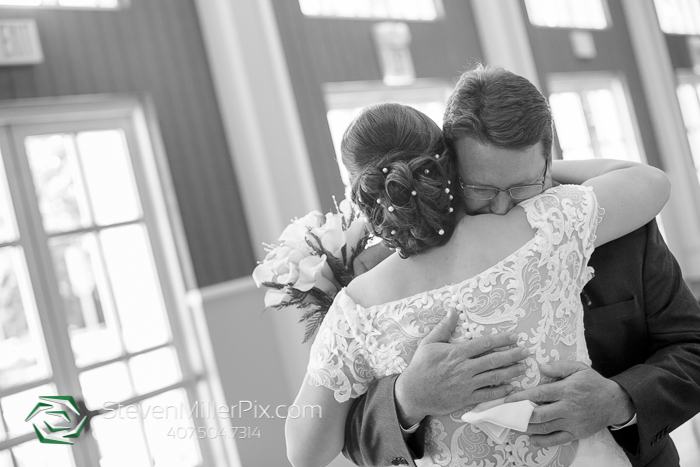 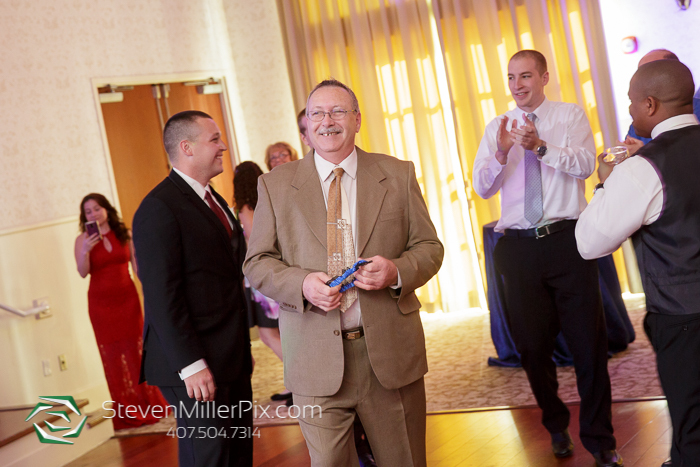 Once they were ready, we first brought Maegan’s father into the lobby to see his daughter in her wedding dress for the first time! 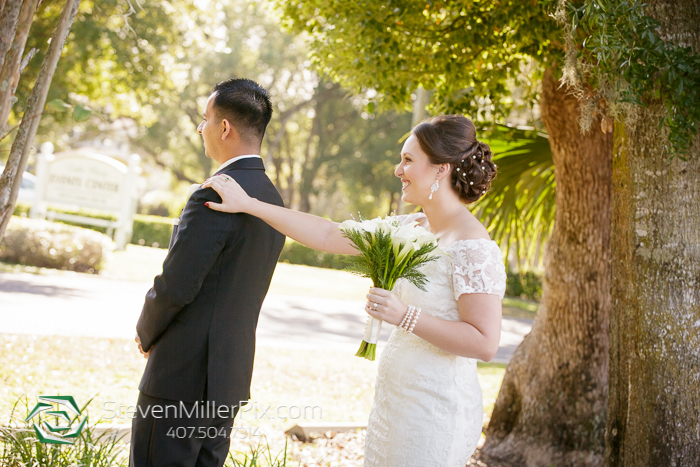 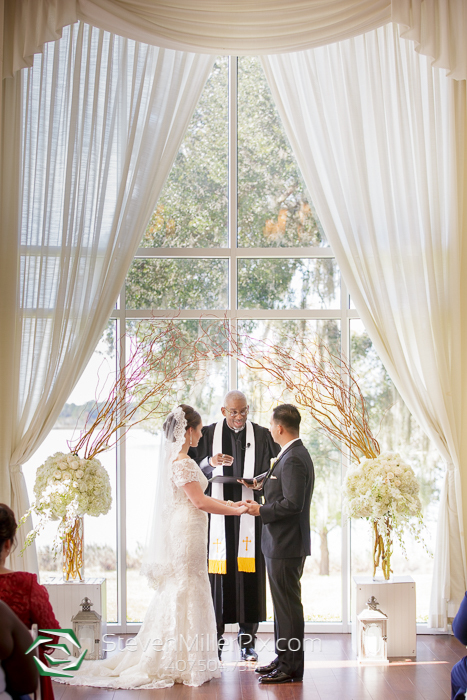 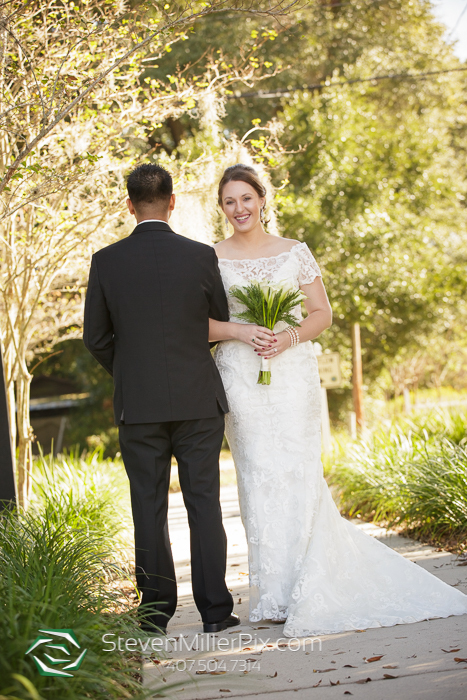 Such a sweet moment, and we followed it by Maegan and Enrique’s intimate first look in front of the Lake Mary Events Center! 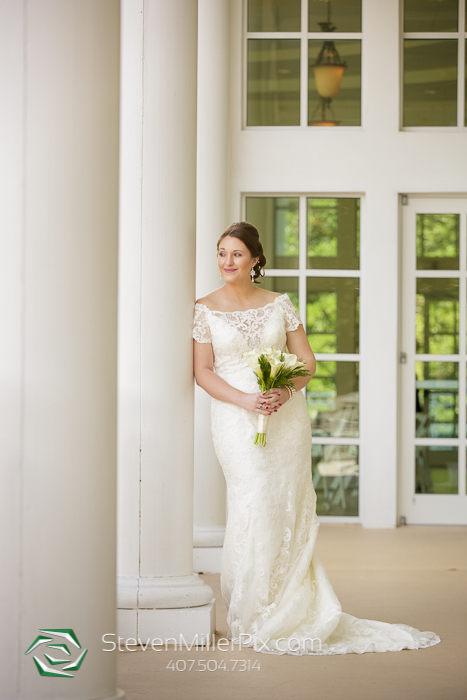 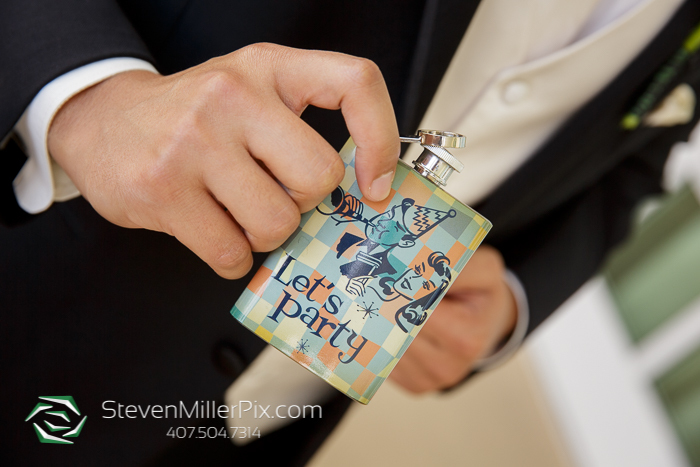 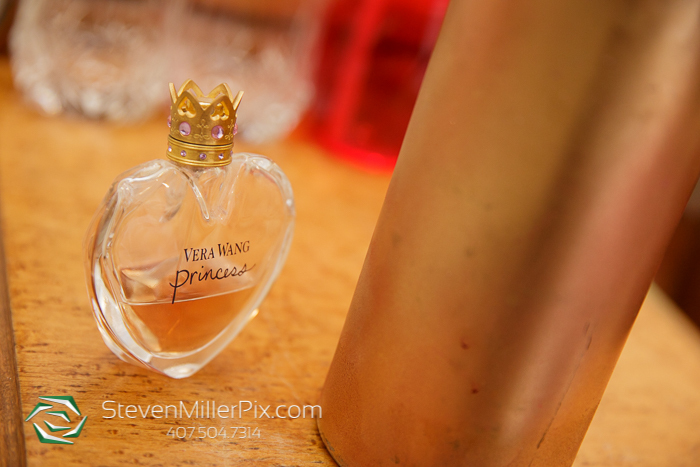 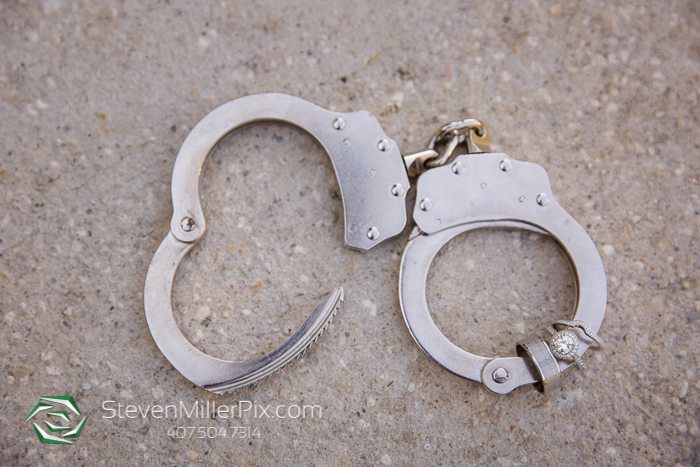 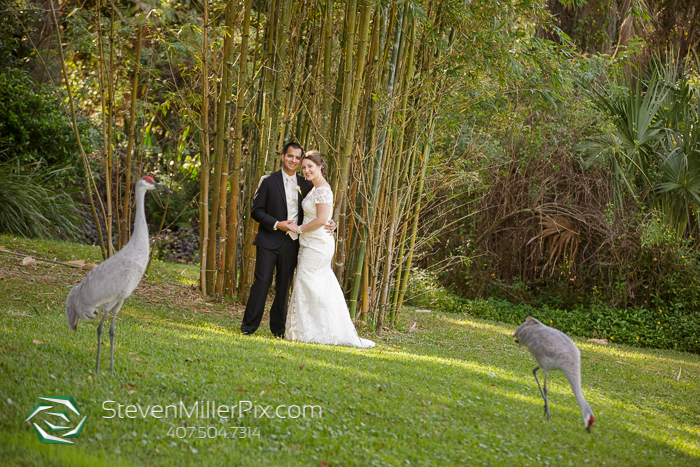 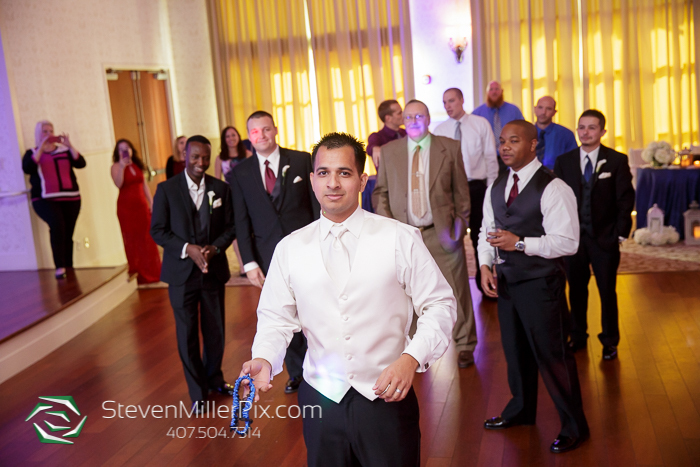 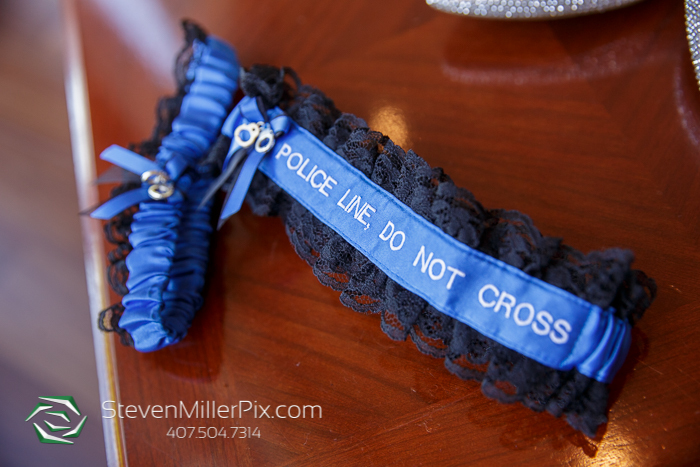 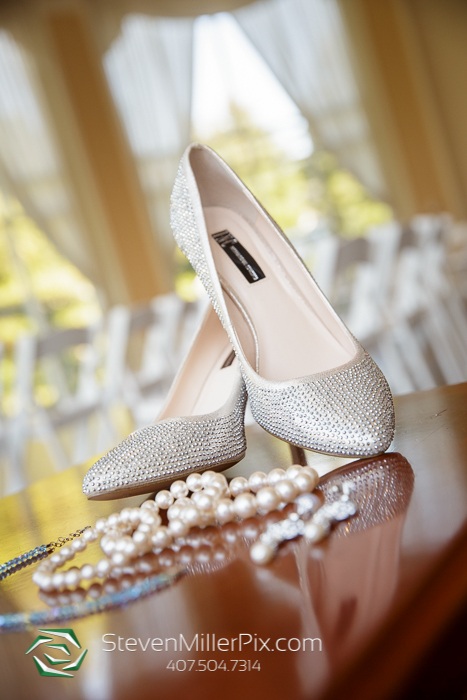 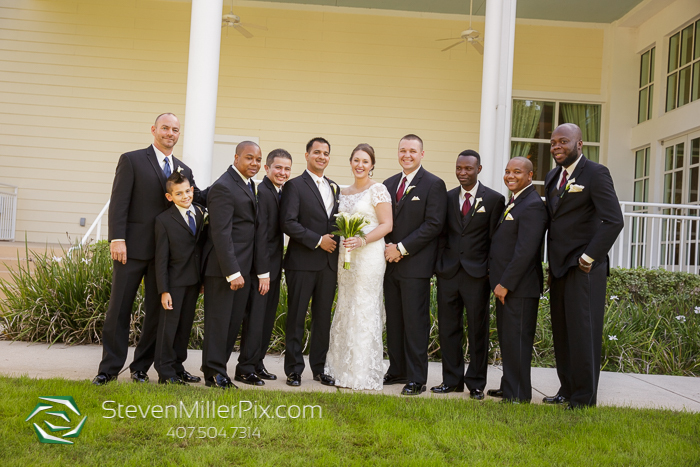 This allowed us to capture their bridal party portraits and personal portraits around the wedding venue! 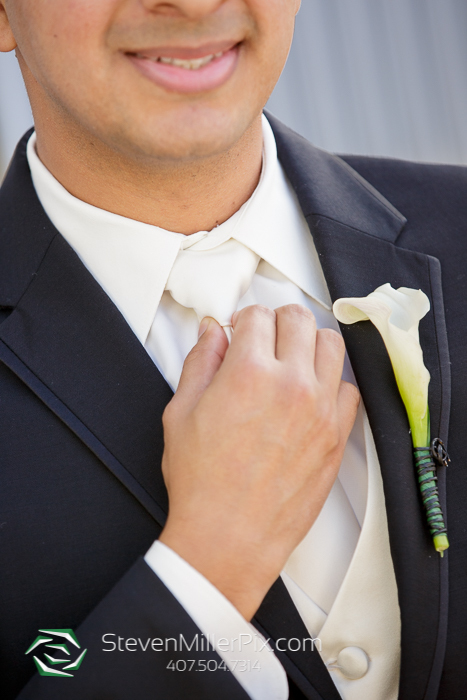 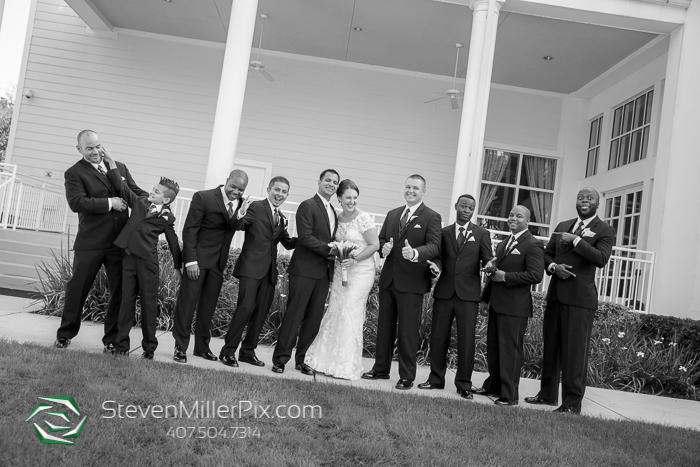 Notice that their bridal party was made up of groomsmen and bridesmen, super unique and cool!! 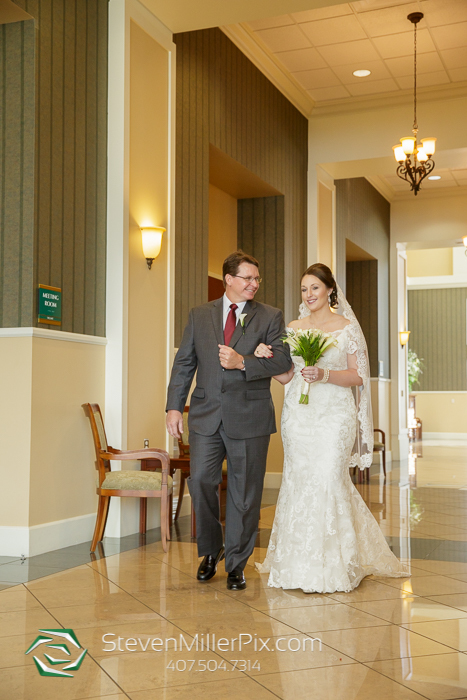 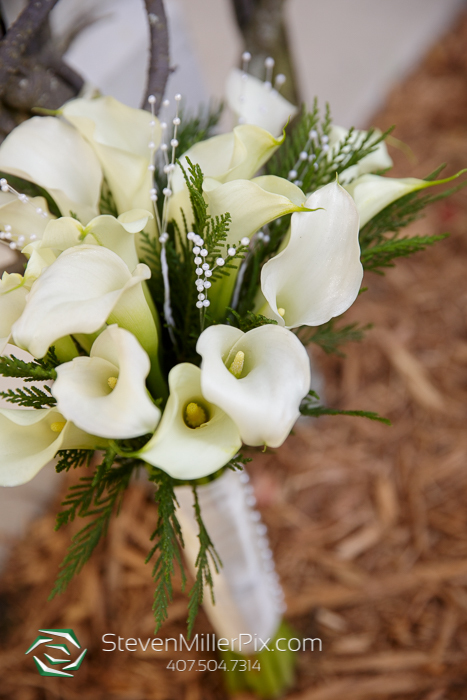 Their indoor wedding ceremony took place in the Lake Mary Events Center rotunda, with floral arrangements created by Longwood Events! 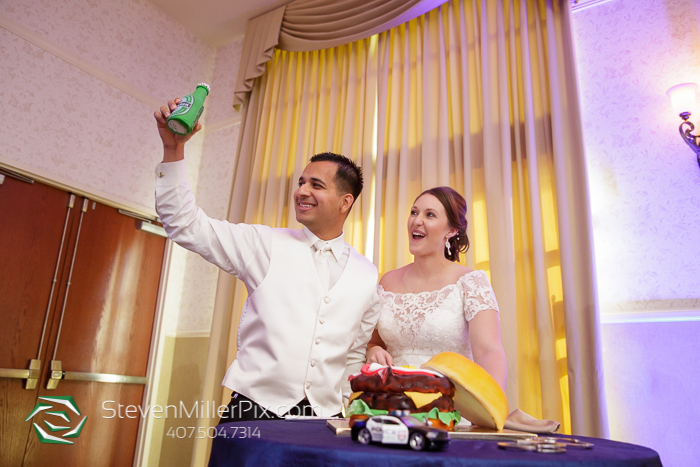 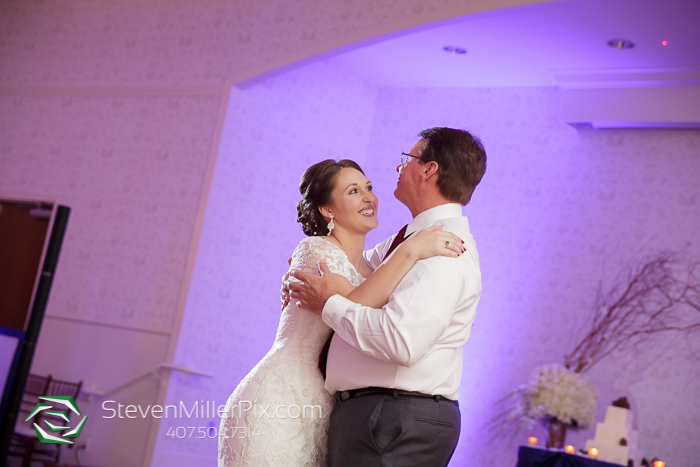 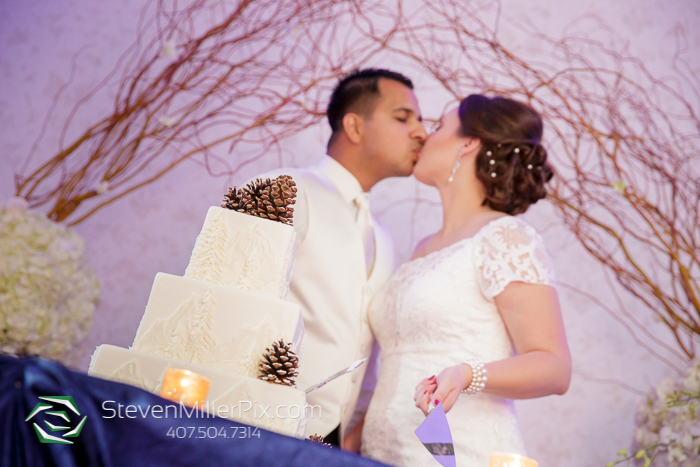 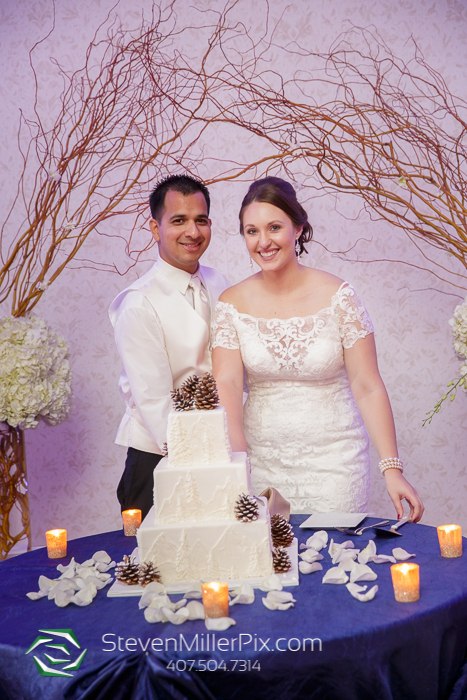 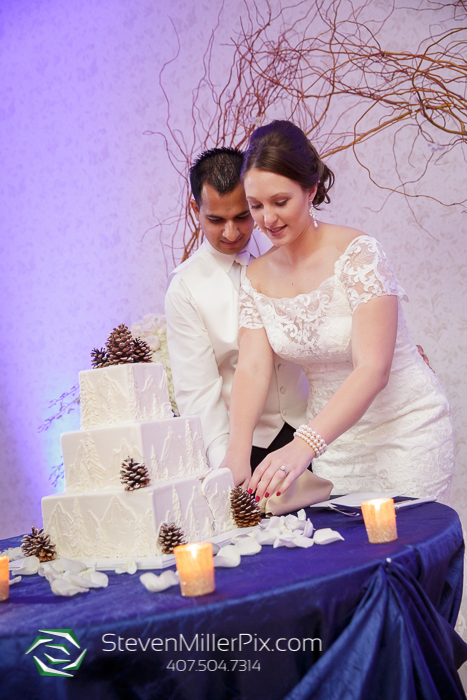 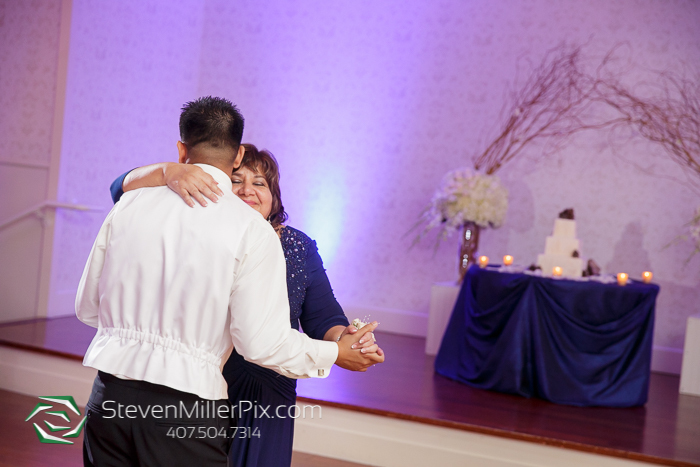 After their I-Do’s, we captured family portraits and proceeded to their ballroom for some beautiful room setup shots, with most decor provided by Longwood Events, and the beautiful wedding cake created by It’s Tasty Too!! 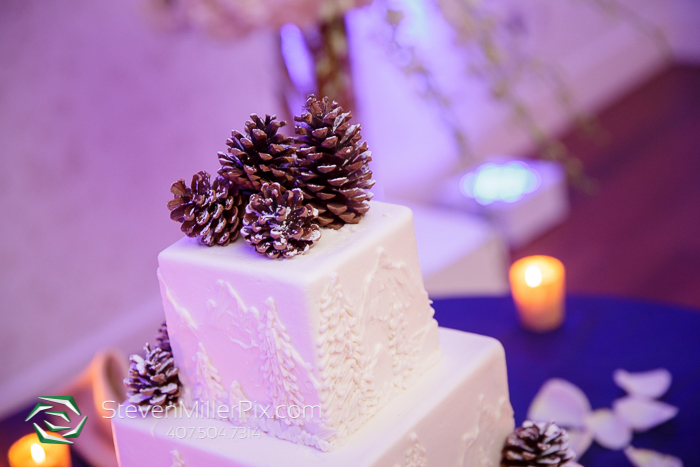 Reminds you of winter doesn’t it!? 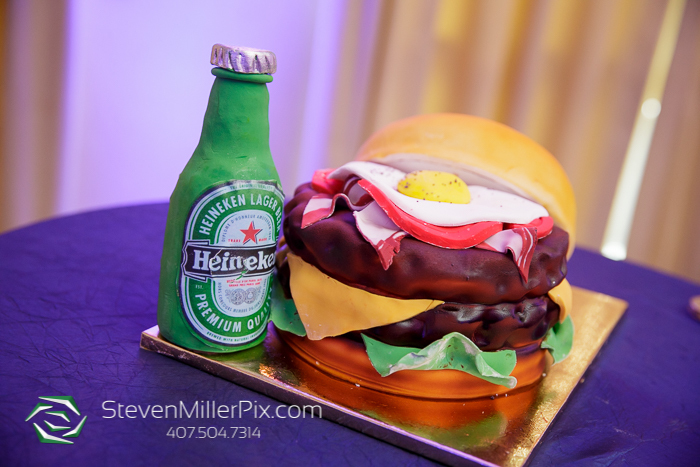 Check out the Groom’s cake as well, very creative!! 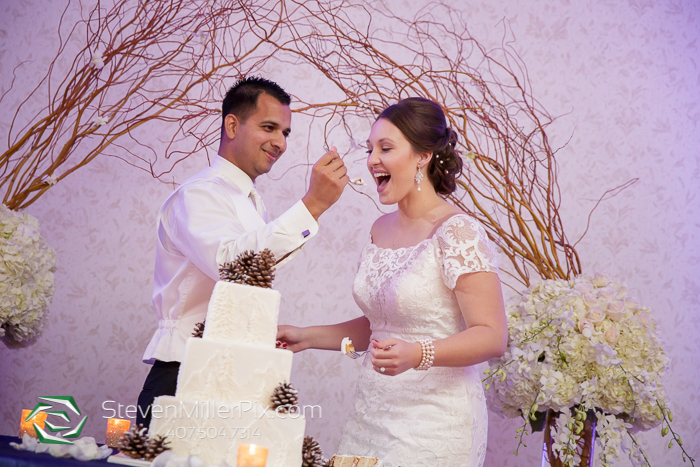 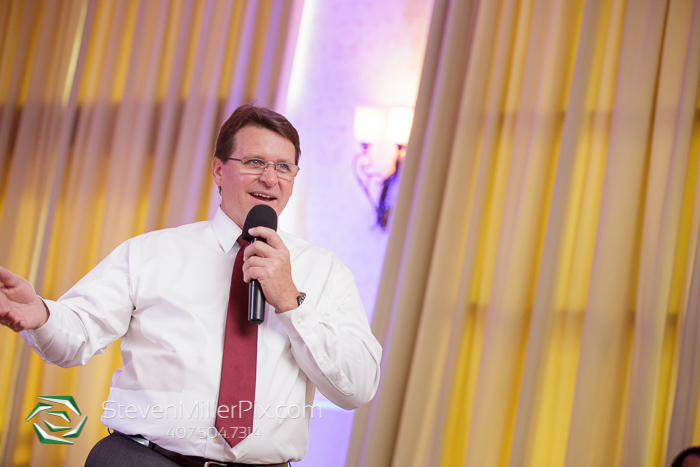 Big City Catering provided the delicious catering and bar services, and DJ David of Meister Productions truly rocked the dance floor and lit up the room with elegant uplighting and pin spotting on the wedding cake! 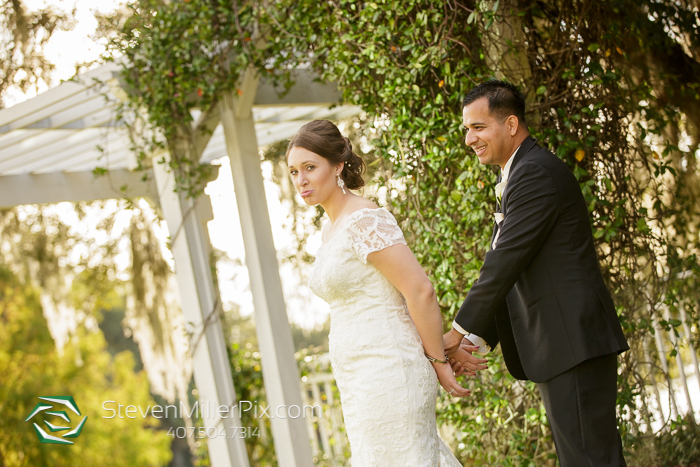 Halfway through the reception we snuck Enrique and Maegan outside for more portraits, considering that we were getting closer to sunset lighting, and wow are these two fun! 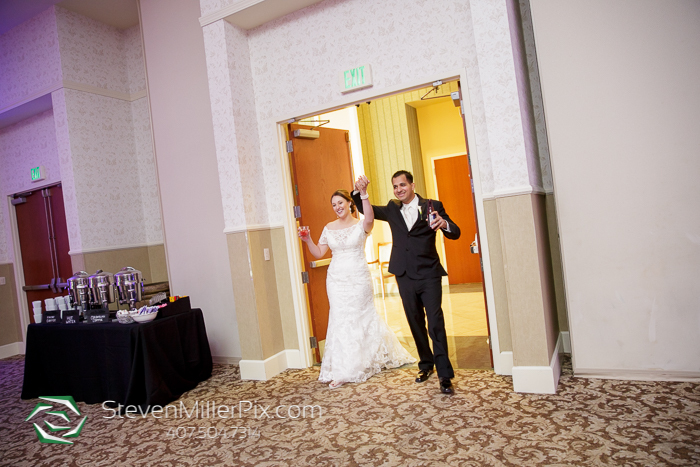 Let’s just say we’re glad we had the keys :). 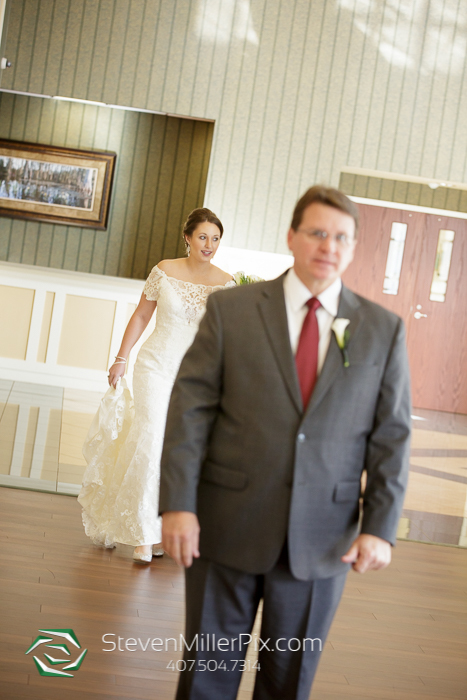 Kristy Rapp of Kristy Rapp Events was a great help with her wedding planning throughout the day! 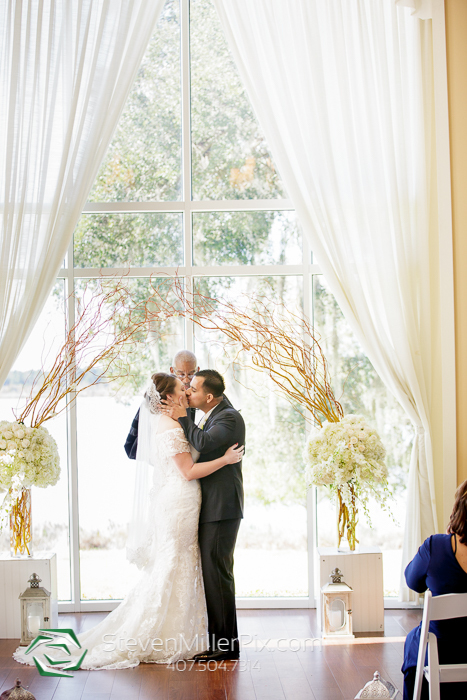 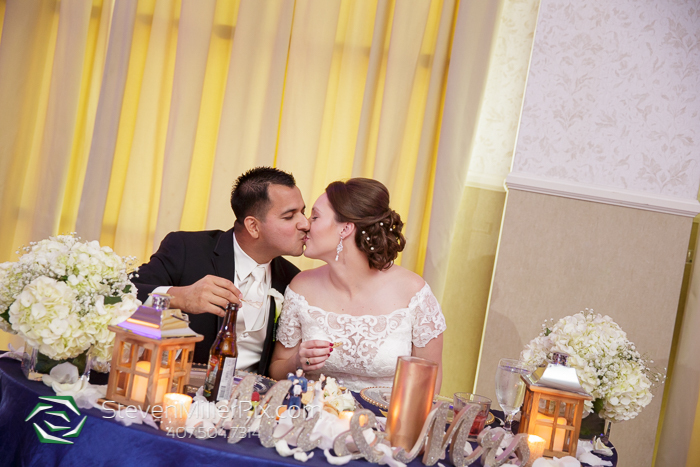 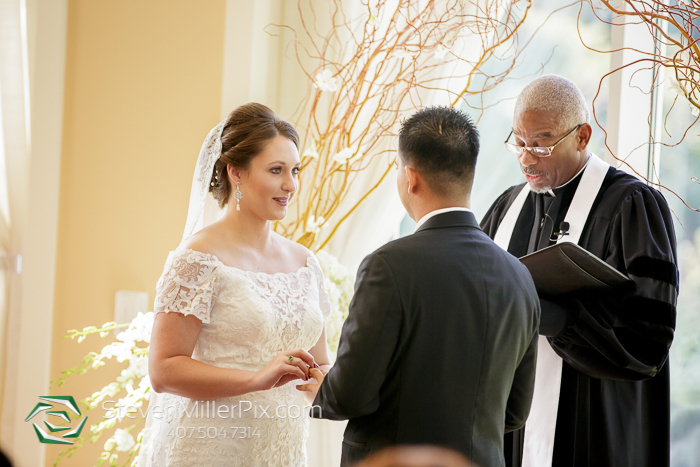 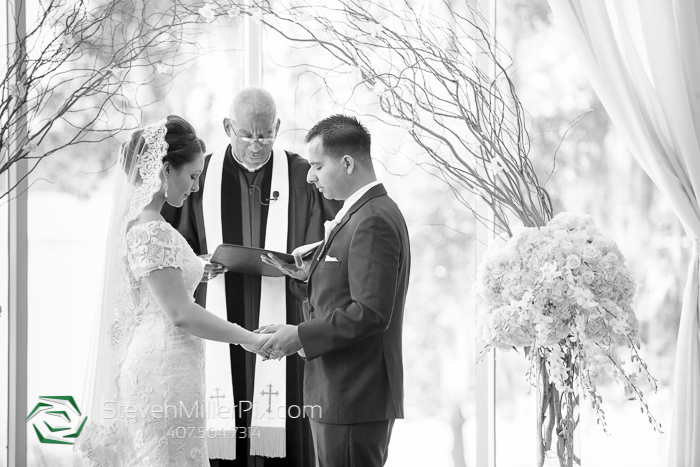 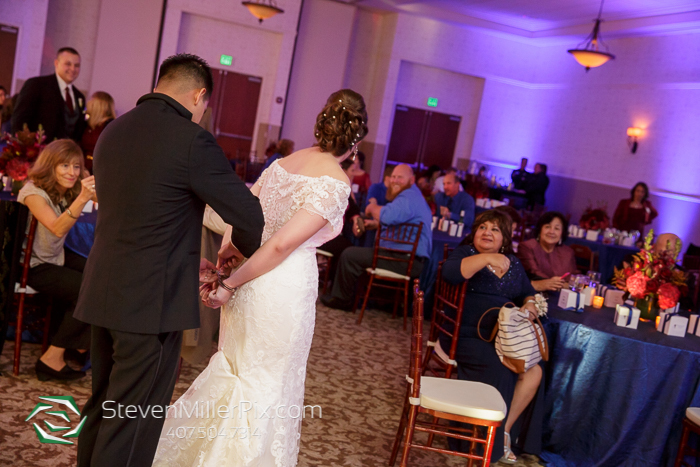 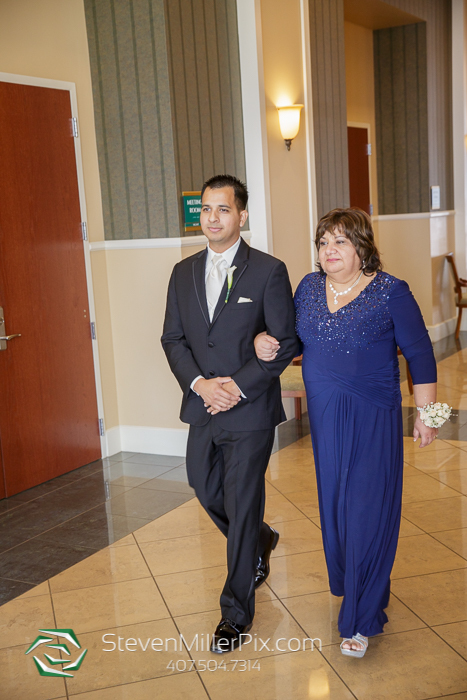 This wedding was such a memorable one for us, and we thank Maegan and Enrique for having us capture their wedding day and this amazing moment of their love story! 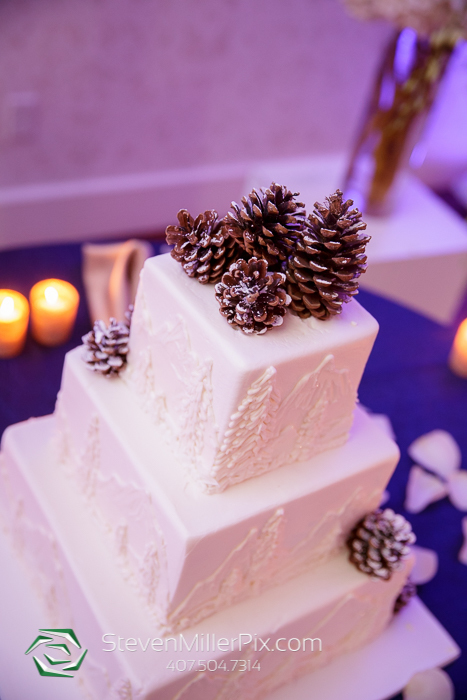 Wedding Cake & Grooms Cake: It’s Tasty Too!